Last week at WWDC was a massive whirlwind of learning, trying, and meeting. I had some time today to decompress and think more about some of the things that were released last week, starting with the Swift 3.0 beta. There are a lot of amazing changes in Swift 3.0, but I wanted to highlight the ones that made me especially happy (i.e. I probably excitedly tweeted about it but want to say more than 140 characters about it). Prior to Swift 3.0, Objective-C has had light-weight generics as a feature, which allows you to write code like ListViewController<Word *> * in Objective-C, but they used to appear to Swift code like ListViewController without the generic type parameter. In Swift 3.0, ListViewController<Word *> * will appear to Swift code like ListViewController<Word> instead, which is a huge improvement. I’m particularly excited that Swift 3.0 will prevent me from writing layout code with NSLayoutAnchor that accidentally tries to constrain an X-axis anchor (like leadingAnchor) to a Y-axis anchor (topAnchor) because hey, we all make mistakes. Type-safe layout code? I dig it. 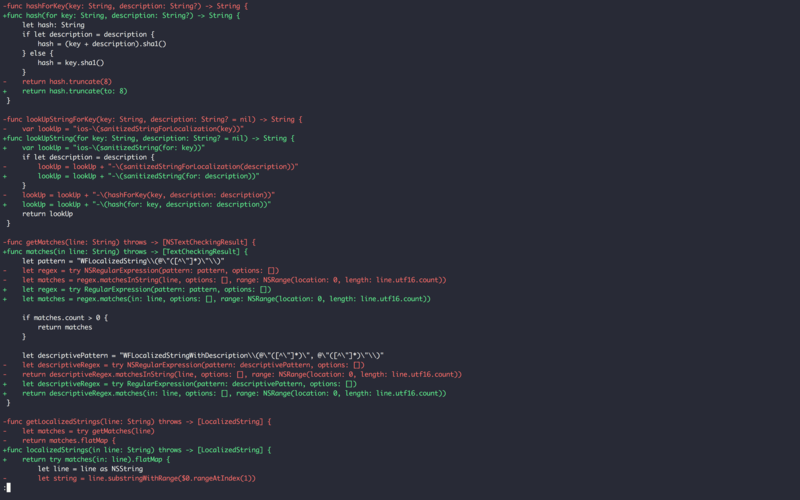 Have you ever had to write stringly-typed KVO code like this? This is very prone to human-error like typos which will lead to crashes. Swift 3.0 adds a new expression #keyPath() which allows us to write the below code instead. Not only do we get the the benefits of static type-checking, we get autocomplete as well! Safe and lazy: my favorite kind of programming environment. Lucky for us, Swift 3.0 adds the ability for C API authors to specify what the API should look like in Swift so it feels more natural, and well, more Swift-y. Look how much nicer the Core Graphics example looks now! Also, if you want to see an even bigger transformation of Core Graphics code, I recommend watching the Swift API Design Guidelines talk. The “Import as a Member” part is somewhere in the last 15 min or so. Speaking of Swift API Design Guidelines, Swift 3.0 fundamentally changes the way that Swift code reads for the (way way way) better. I think the best way to experience these principles is to download Xcode 8 and run your code (maybe a small Playground at first) through the Swift 3.0 migrator. I tried it on a small project, and this is what I ended up with. You have to do some manual changes too (like choosing the right prepositions), but overall the migrator is 💯 and will do everything it can to make the transition process as smooth as possible. Anyway, what do we read here? If you want to hear more details about Swift 3.0’s philosophy, I again recommend watching the Swift API Design Guidelines talk. The official Swift API Design Guidelines page is a great companion reference as well. There are a tonne more features that were added in Swift 3.0, and you can learn about them on swift-evolution. Although I don’t follow the mailing list, I love skimming through the accepted and rejected proposals to see what kind of thought and reasoning went into each design decision. It’s especially interesting to read through the tradeoffs and alternatives that were considered, since this process applies to all sorts of engineering beyond programming language design. I think it’s also worth noting that a lot of the “new” features that were added to Swift relate to having better Objective-C and C support, which may sound counter-intuitive/productive at first. But I think if we want the future to be Swift-y, we need to make sure that existing apps and frameworks that are written in Objective-C and C can seamlessly and naturally fit together with the Swift world, so that the entire community — not just the entirely-Swift apps — can proceed fearlessly into the new world. I think Swift 3.0 does a great job of building that bridge. One workaround was to copy all of the script code into a Playground and do the migration there, but things got really annoying when I tried to import CommonCrypto (long-ish story for another time), and it also felt weird to have a Playground doing file I/O. All you have to do is run the follow line from the command line. If you are like me and are using CommonCrypto and have defined a module map for it to get it to work in a script, we can just ad the -I CommonCrypto option to get it to work property. Both classes and structs are the main building blocks of most applications. They help us organize our code into pieces that we can reason about more intuitively and with greater ease. Today, we’ll go over how classes and structs behave differently from each other, and finish off by starting to think about when to use a class vs. when to use a struct. I highly recommend downloading the Playground or cloning the repo to follow along. Classes allow us to model many real world examples and help us organize and reason about our code. For example, we might want to make a shopping app. In our app, you can choose items, put them in a cart, and find out the total to pay. First, we need to buy a chicken hat. (Well, I need one. Why not?) I found a hand-knit wool chicken hat for $50 and a crispy green apple for $1. (I hope you like apples.) Let’s put those in the cart and calculate the total. The total we expect to pay is $51. That seems like a pretty good deal, especially for such a high quality chicken hat. Let’s go and pay before we find the urge to buy more stuff. While we’re strolling toward the checkout counter with the soon-to-be-ours chicken hat and apple, the shop decides to increase the price of the chicken hat to $1000. When they ring up our items at checkout, the total is $1001. We were expecting to pay $51. Not 🆒. Classes are passed by reference meaning that there can be more than one reference to a given instance of a class. So in our case, we had a reference to 🐔 in our Cart instance, but we also had a reference outside the cart which allowed the shop to change its price on us unexpectedly. So what’s the alternative to passing by reference? That’s where structs come into play. In Swift, there are structs (short for “structures”). Like classes, they allow us to model many real world examples and help us organize and reason about our code. Unlike like classes, which are passed by reference, structs are passed by value. Let’s see what happens if we make Item a struct instead of a class. All we have to do is change it from class to struct in our declaration. Now let’s try shopping again. I still need my chicken hat and you’re still hungry for a green apple. We put those items in our cart, and the total is $51 as before. The shop, again, decides to increase the price of the chicken hat to $1000 (maybe we should stop shopping here?). What’s the total in the cart? What was different in the struct example compared to the class example? When something is “passed by value” (which is the case for structs, but not classes), the value is copied on assignment instead of sharing a reference. So when we created the items array like var items = [chickenHat, apple] that chickenHat was already different from the chickenHat from var chickenHat = Item(name: "🐔", price: 5000). If you’re curious, you can update chickenHat’s price right after we create items and see what the playground thinks is the value of items. As you can see above, items has not changed. However, if you do the same when Item is a class, you get the following result. The chicken hat in items is $1000! It’s also worth mentioning that value-types are nothing new. Take a look at this for example. If Int’s were passed by reference, y would also be 2 at the end, but it’s not because it’s passed by value. In Swift standard library offers many value-types, including but not limited to Int, String, and Array. Structs are just another addition to this family, and we can start using them immediately. Learning how structs and classes behave similarly and differently. Learning when to use structs and when to use classes. I leave you all with some resources that I recommend for both parts. 1. Learning how structs and classes behave similarly and differently. For this, I recommend experimenting in a Playground (maybe you can extend the example that we worked on today!) and reading explanations from many different sources. Hopefully, this post was also a good introduction to this. If you want to keep exploring, we only made Item a struct in our example, but what happens if we also make Cart a struct? What changes? 2. Learning when to use structs and when to use classes. This is a much more nuanced and difficult topic, and for me, I’ve been learning mostly by trying things out and making mistakes. Luckily, some people have been writing and talking about what they’ve learned, so you can make fewer mistakes to start with. Drew Crawford’s blog post Should I use a Swift struct or a class? The TL;DR: at the end of the post is a must-read too. Mike Ash’s Q&A on when to use structs and classes. Andy Matuschak on objc.io in which he discusses the “value of values” and the “object of objects” and more. Boundaries by Gary Bernhardt goes over value-types and how to use them effectively with reference-types. This isn’t Swift-specific, but it’s a nice reminder that these concepts are relevant across different languages and problems. Today we’ll take a jog down memory lane starting with the release of Swift 2.0 at WWDC 2015 all the way to the announcement of iPhone OS at Macworld 2007. For some of you, it will inspire a mix of nostalgia and flashbacks, both good and bad. For others, this will be a glimpse into the past it was. There are many moments in this brief history that make me think, “What year is it? !” Although it’s 2015 and Swift 2.0 is new and shiny, I hope that we can look back a year, 2 years, 5 years from now and exclaim, “What year is it? !” because in the future there’s what we can only imagine, and so much more. Swift 2.0 is released. guard, new error handling, fewer bugs, I love it! Plenty of great content on Apple’s WWDC page. October 5: First commit to Carthage. Swift is announced at the WWDC Keynote. This was the WWDC Keynote I had ever seen in person. I almost fell out of my chair. It was surreal. Objective-C has served us so well for 20 years. We absolutely love it. But we had to ask ourselves the question: What would it be like if we had Objective-C without the baggage of C? We did more than think about it. We have a new programming language. The language is called Swift, and it totally rules. If you want to relive this moment, check out the keynote around 104:30.
instancetype keyword added to SDK. Before this, something like NSString *string = [NSArray array] would have compiled because NSArray’s +array method returned type id. 😱 What year is it?! More fun Objective-C things in Advances in Objective-C from WWDC 2013. Feb 26: First commit to ReactiveCocoa. October 5: Steve Jobs passes away. August 7: First commmit to CocoaPods. May 29: First commit to AFNetworking. Delivery of a fully featured version of ARC (Automatic Reference Counting) with iOS 5. I hope you’re not too sad. I mean, maybe you’re attached to them. I can’t really help you out with that. You can choose to not use ARC if you want, but you really should just use it. You can now add ivars in class extensions or directly in the implementation. Natural scrolling is introduced with OS X Lion. I remember when this felt completely backwards. Now I can’t imagine going back. Xcode is now free on the Mac App Store and only 3GB because they split it out into smaller packages! Xcode 4.0 was sold for $4.99 on the Mac App Store to the general public (non-Developer Program members) until 4.1 was released. March 9: Xcode 4 is released, pulling Interface Builder into Xcode instead of having it a separate app. Imagine having to run Xcode, Simulator, and Interface Builder to do development with xibs. LLDB announced as a replacement for GDB. iPhone has 28% of US smartphone market share. January 18: First commit to three20. This is the first third-party library that I tried to use. The rest is history. Deprecated and archived. January 8: Steve Jobs announces the iPhone OS at Macworld. An iPod, a phone, and an Internet communicator. An iPod, a phone. Are you getting it? These are not three separate devices. This is one device. We are calling it iPhone. I’ll leave the video here. You should watch it. If you’re used to Objective-C, you might be wondering if there’s anything special about Swift enums. The answer to that is a huge YES. Swift enums are way more powerful than Objective-C enums, and I promise you that you’ll love them. And for everyone else, you’re in for a treat as well. You can follow along the code examples by cloning this repo or downloading the Playground directly. Maybe it’s because I’ve been writing a lot of UI code this week, but the first thing that comes to mind when I think of a group of related values I think of the idea of a “side” as in top, left, bottom, and right. You can even add raw values to your enums like Int below. The raw values are implicitly assigned as 0, 1, 2, and 3 respectively. If we change Int to String, the raw values become "Top", "Left", "Bottom", and "Right" respectively. Notice that we’ve explicitly assigned raw values instead of having them implicitly assigned. (Yes that’s another thing we can do with enums, 🆒!) You’ll see why we did this in a moment. Wouldn’t it be nice if we could initialize a Message with the JSON dictionary that we get back from the API? Let’s see what this would look like. which is initializing a Status with a raw value. For example, Status(rawValue: "sent") would become Sent and Status(rawValue: "draft") would become Draft. But that’s not all! I promised you two examples of using enums when dealing with API’s, so let’s keep going. When dealing with an API, there are many things that can go wrong. The request could fail because we have no network connection or the server is down, or maybe the request succeeds but we get malformed data. Swift 2.0 changed the way that we handle error handling for most cases by introducing throws (more info on The Swift Language Guide). throws is great for guiding control flow (might write about it later if anyone is interested), but there’s one pretty big problem. We can’t use it for anything that is asynchronous, but asynchrony is the nature of API requests. The function listMessages takes in a completion handler completion that that takes [Message]? and NSError? as parameters. If the request is successful, completion gets called with messages with some [Message] result and error as nil. If it fails, completion gets called with messages as nil and error as some NSError. This is a pretty standard approach, especially if you’re coming from Objective-C like I did. So is there anything wrong with it? Well, kind of. What would you do if you got a result where messages is nil and error is nil? Or maybe you get non-nil messages but you also get a non-nil error. These are states that should be impossible, but they aren’t because we can write code that lets this happen. How do we write better code that doesn’t get into impossible states like these? Swift enums have these things called associated values that let us write safer, more predictable code. Associated values are literally what they are called. You can associate values to your enums. For example, we can define a Shape enum that has two cases Rectangle and Circle. Rectangles can be defined by a width and height, so we are going to associate width: Int and height: Int to Rectangle. Circles can be defined by a radius, so we are going to associate radius: Int to Circle. Given this, we can now construct Rectangle’s and Circle’s. Let’s apply this to our API request example. Our problem was that we could get into weird states with messages and error both being nil or both being present. Well, if we don’t want them to be together, why not split them in to different cases? Sounds like the job for an enum! We can declare an enum called Result that has two cases: Success and Error. But wait. What if we wanted to use this beautiful Result type for handling API responses for other endpoints like /users in addition to /messages? We can make the enum generic on type T and have the associated value’s type for the Success case. (If you are unfamiliar with generics, please take a look at Generics first!) Note that we removed the names of the associated values messages and error because they were a little redundant and also optional. Isn’t it so clean? Don’t you just want to go off and write yourself a beautiful API client in Swift?! Well even if you’re not quite as excited to that degree, maybe you’ve learned some things that you can start applying to your code immediately. At least that’s what would make me happy! I recommend reading Apple’s The Swift Programming Language documentation on enums if you want to learn all of the other details about enums. If Result type is interesting to you, check out antitypical/Result for an example. It adds a few more features and is a bit more complex, but the core of it is the same. There are some Swift concepts that really made my head hurt when I was first trying to grasp the concepts. Here are some of my favorite explanations for some of the things I found most difficult to understand. Hope you find them useful as I did! It’s easy to get into a nightmare spaghetti situation of types when you’re first starting with Swift protocols, especially if you try to genericize them. Russ Bishop has a great, easy to follow explanation where he walks you through the “wat?”s of Swift’s associated types. Many people will tell you that you should use struct as much as you can (including me!). But from experience, I have run into cases where I was bending over backward like a dried up Gumby doll to make something a struct, and it ended up being way cleaner when I turned it into a class. Drew Crawford has a great guide for choosing between a struct or class if you ever find yourself in a similar situation. Thanks @hyperspacemark for showing me this! 🙌🏼 Let me know what you think of this format! If you like it I can continue having posts like these in addition to my longer form explanation posts. Thanks for reading! Generics are one of my favorite features of Swift. Like Optional, it makes your code safer to work with, makes your app have fewer crashes and unexpected bahaviors, and at the end of the day, it makes your users happier. It’s one of the core features of Swift that make it great language to work with, and I think you’ll love it as well. Without further ado, let’s get started! But we get an error Cannot convert value of type 'Int' to expected argument type 'String'. We can redefine Pair as below. Note the addition of <T> and T for both of the types. Now we can do all things. You can even make a Pair of Pairs if you wanted to! Magical, eh? And who said pairs of things have to be of the same type? What if "Thing 1" wanted to hang out with 1 for a change? Let’s try it. The error is saying that we can’t create a Pair that has different types for first and second because we said they are both type T. How do we fix this? We add a another generic to Pair! Pair now is generic on T and U, where first is of type T and second is of type U. If we try to initialize ones again, it now works. It’s old convention to use T (for “Type”), U, V, etc. to signify the generic type, but you can really name it anything. @UINT_MIN pointed out that Swift is moving toward more descriptive naming, like Optional.Wrapped and Array.Element. I also learned today that you can even use emoji 😻 (with a few caveats so see the full list of allowed emoji). Thanks @jckarter and @nnnnnnnn! Even if you don’t find yourself defining your own classes and structs that are generic immediately, I bet you’ve used them before whether you knew it or not. As programmers, we very often work with arrays. On any given day, you might declare an array of monkeys. Sometimes, we get sleepy, doze off a bit, and accidentally try to insert a number into our array of monkey emoji. 😪 But Swift being Swift, the compiler has our back and says: Cannot convert type 'Int' to expected argument type 'String'. If you scroll down a little further, you’ll find the documentation for the append function. Aha! append takes type Element as a parameter, Element as in the type that Array is generic on. So if we initialize var monkeys with type Array<String> we have to call append with a String and Int won’t work. And now you know. Generics chapter in Apple’s Swift Language Guide.